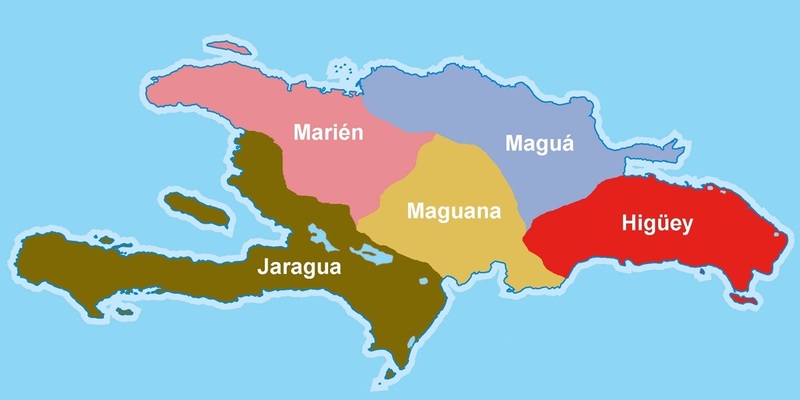 Quisqueya or Kiskeya is a name in the Táino language that means "big land" or "Mother of all Lands" to the natives of the islands surrounding Ayiti. This map of until 500 years ago shows what today is known as Haiti and the Dominican Republic. Ancient names given to the island by its original inhabitants before the arrival of Christopher Columbus, the Táinos, include Ayiti, Quisqueya, and Bohio. Bohio means "rich in villages". Ayiti is composed of three roots: "A" meaning flower, "Y" meaning high, and "TI" meaning land or region. Ayiti hence means "flower of high land" or "mountainous land" in the original Táino language. The Tour is the brainchild of the Léogâne Cycling Club (LCC), one of the partners in Mountain Bike Ayiti, which drew several dozen athletes from near and far to the mountains of the Pic La Selle Range in early 2013. That year, during a sports medicine conference in Haiti attended by members of the American Medical Society for Sports Medicine, Dr. Chuck Peterson of Arizona and the LC Club President Mr. Jonas Ronald first discussed the idea of creating a cross-border road-cycling event connecting Haiti and the Dominican Republic through a supported Tour. In recognition of the geographic name of the island shared by both nations, the project was originally named "Tour d'Hispaniola" and carried at its heart the desire to promote peace and brotherhood through friendly athletic exchange and competition. During the latter part of 2014, Mr. Ronald's vision gained the support of a number of individual cycling enthusiasts and several grassroots non-profit organizations in both the United States and in Haiti. A Tour Planning Committee was established and a face-to-face meeting between a delegation of international partners and the LCC was conducted in January of 2015. At this meeting it was resolved that the original idea, which was to cycle from Léogane to Santiago de los Caballeros in the Dominican Republic, was to be piloted during the month of May 2015 by a small group of cyclists and supporters to assess feasibility, road conditions, logistical barriers, security and all other aspects required for a guided cycle experience open to the public. For even more background on the bilateral relationship, this article may help. In recognition of current and historic political, socio-economic, and cultural divides between the two peoples, the Tour Planning Committee convened another meeting in Léogâne in May of 2015. The meeting was attended by over 30 parties and many of them had traveled from afar to be able to participate in the discussions. 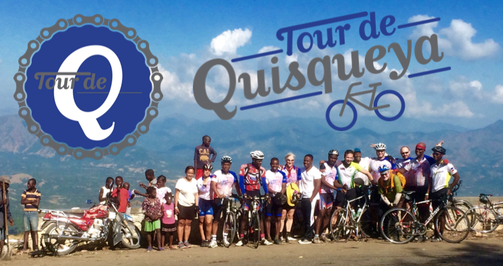 During the meeting it was resolved that the Tour would henceforth be called "Tour de Quisqueya", and that it would initially and in its first public editions be limited to Haiti only. The planned reconnaissance mission took place subsequent to this meeting when two groups - one by bicycle with vehicle support, the other by car - made their way all over the country to ascertain the feasibility and safety of the proposed route. 2016 Premier Edition of "Tour de Quisqueya: Cayes - Cap Edition". including 7 fully sponsored local Haitian cyclists. ​from Port-à-Piment via Jacmel to Cap Haïtien. ​Escape the Winter. Cycle in Paradise. Re-Imagine Haiti. Imagine the Possibilities. ​Seeking the Extraordinary. Seeking You. Organizers and supporters hope that this project will continue to be repeated in years to come, with variations along domestic routes as well as the eventual inclusion of the cross-border component. We continue to work towards making progress on this issue, and are looking forward to continuing our conversations with both Haitian and Dominican cycling enthusiasts at home and abroad. The choice of "Tour de Quisqueya" as the name for the project, despite re-branding complications and additional expenses incurred, allows for a future inclusion of the Dominican Republic since the name in its chosen spelling is known on both sides of the island as the pre-Columbus name of the island. the heart of the Caribbean.